The Imperial Malaia Garnet story is told in letters below from All That Glitters to GIA, as well as in the related article published by GIA. We had been essentially the sole purchaser of this material, with a few exceptions. The exceptions would be the importer who obtained the rough from the person digging in Madagascar and one rough dealer. All this material dried up shortly after our original purchase of a few pieces of larger rough. We have had very few stones over the past 5 years (2003 timeframe) though we have constantly attempted to obtain more from the source. As of 2014, we haven't seen anything that really seemed to be Imperial Malaia Garnet in the rough or faceted, though a few dealers abroad have labeled their garnets as Imperial Malaia. Note that the stones look dichroic (two distinct colors displaying within the stone - the property is not very evident in these photos).Thisdichroic property is impossible because of the physical property of garnets.There are some gemstones, however, that "seem" to be dichroic - this is due to strong anomalous refraction and this is one of the reasons why this find is unique. Also note that there is a strong color shift from typically a very pale orange, pink or beige/tan, to intense pink, pinkish red, orange, reddish orange, peachy orange, etc. Since light sources typically contain many wavelenths and many rooms contain different light sources, these stones will typically show many different colors at the same time. Truly, a unique gemstone rarity. We know of no other companies currently selling this material. We have seen a number of companies selling Garnets as Imperial Malaia. They would fall into another category of perhaps Champagne or Malaia, but not the Imperial Malaia category/group. It is most likely a designation for a higher asking price. 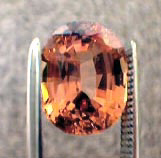 The Garnet Group is very diverse and many tests have to be performed in order to find out what group a Garnet may belong to. Some of these tests, especially where elemental percentages are examined, have to be performed in a laboratory environment with instruments costing millions of dollars. This is frequently by-passed due to cost and items may be identified by sight. For the Garnet Group, this may not be sufficient to determine which group a Garnet falls into, and that might also be sufficient depending on one's goal. "The Imperial Malaya suite arrived and the gems are STUNNING! I must have, thanks to you, one of the best collections around." "The garnet arrived today and it is fabulous! The cut, polish and colors are excellent and we appreciate your insistence on supplying high quality product. You have enriched our lives with this wonderful gift and we thank you for that. Warmest regards." "I am indeed grateful to have the opportunity to purchase such a beautiful product of nature."